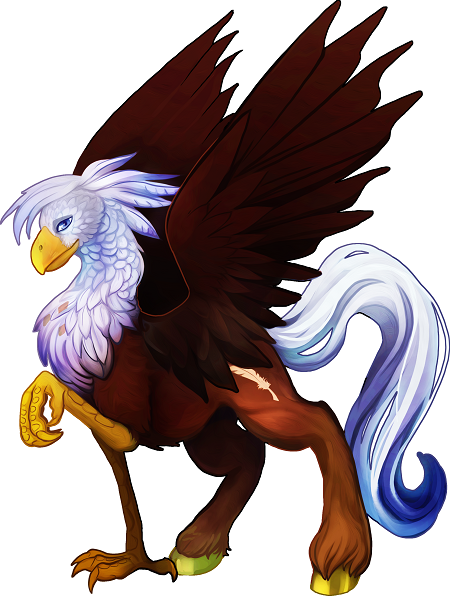 Living proof that griffons and ponykind can more than just peacefully coexist, hippogriffs display a practical ambition reminiscent of both their parents’ species. Ability Score Increase: Two different ability scores of your choice increase by 1. Age: Hippogriffs mature at the same rate as humans, but live nearly two centuries. Alignment: Hippogriffs tend to lawful when raised among ponies, but when raised by griffons or other hippogriffs, they are often neutral. Size: Your size is Medium. Speed: Your base walking speed is 40 feet. Languages: You can speak, read, and write Common and Sylvan. Sylvan is a musical language of fey creatures, and their sing song can find its way into other languages. Four-Legged: Being a four legged creature, you can bear greater weights (+50%) than a humanoid of the same size and Strength. Any roll to avoid becoming prone is made with advantage. Sharp Beak: You have a natural bite attack that deals 2d4 slashing damage. You are proficient with this weapon. Unique Destiny: You gain advantage on checks with a single skill that is tied to the brand of destiny on your flank. Wings: Your base flying speed is 25 feet. You cannot fly if you are wearing armor you are not proficient in, armor not tailored to accommodate your wings, or a backpack not specially tailored to your wings. While flying, you are vulnerable to piercing damage, and you have disadvantage on strength checks to interact with objects that are on the ground. You fall to the ground at the end of your turn unless you move at least half your fly speed during your turn. Ponyfinder: 5th Edition © 2015, Silver Games, LLC; Authors: David Silver.